So how well do you know your animals? Were you able to figure out what pet this is? Q: These small long- tailed rodent pets originated in Mongolia. While not rabbits, they do thump their feet at times of excitement or stress. What is the name of this pet? 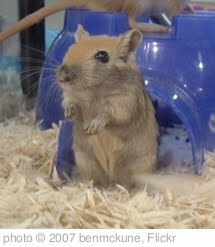 A: The gerbil! These little critters were the first pets that I remember having and taking care of. Frisky and Finicky were their names and I could spend all day watching them. They helped me on my way to becoming a responsible pet owner. What was your first pet? If you guessed you get an entry into this month’s Pet Pop Quiz Contest. Come back on Monday for another question and another chance to get an entry.